Citation Information: J Clin Invest. 2010;120(7):2379-2394. https://doi.org/10.1172/JCI41203. PDGF-dependent hepatic stellate cell (HSC) recruitment is an essential step in liver fibrosis and the sinusoidal vascular changes that accompany this process. However, the mechanisms that regulate PDGF signaling remain incompletely defined. Here, we found that in two rat models of liver fibrosis, the axonal guidance molecule neuropilin-1 (NRP-1) was upregulated in activated HSCs, which exhibit the highly motile myofibroblast phenotype. Additionally, NRP-1 colocalized with PDGF-receptor β (PDGFRβ) in HSCs both in the injury models and in human and rat HSC cell lines. In human HSCs, siRNA-mediated knockdown of NRP-1 attenuated PDGF-induced chemotaxis, while NRP-1 overexpression increased cell motility and TGF-β–dependent collagen production. Similarly, mouse HSCs genetically modified to lack NRP-1 displayed reduced motility in response to PDGF treatment. Immunoprecipitation and biochemical binding studies revealed that NRP-1 increased PDGF binding affinity for PDGFRβ-expressing cells and promoted downstream signaling. An NRP-1 neutralizing Ab ameliorated recruitment of HSCs, blocked liver fibrosis in a rat model of liver injury, and also attenuated VEGF responses in cultured liver endothelial cells. In addition, NRP-1 overexpression was observed in human specimens of liver cirrhosis caused by both hepatitis C and steatohepatitis. 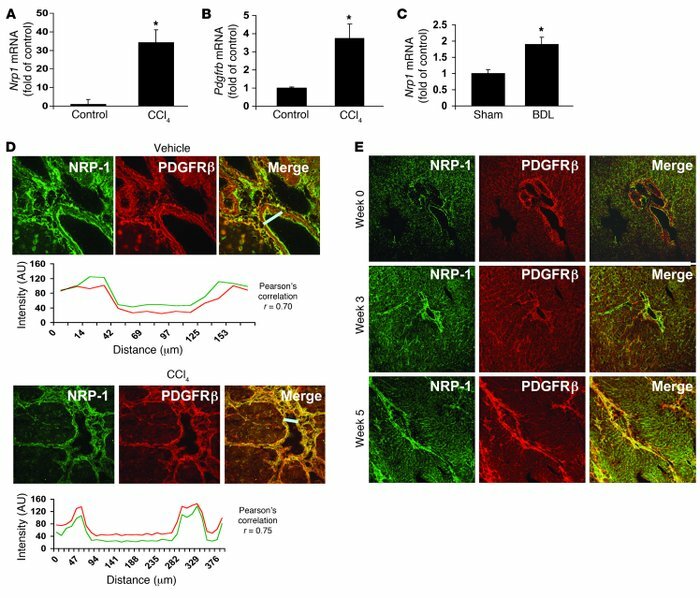 These studies reveal a role for NRP-1 as a modulator of multiple growth factor targets that regulate liver fibrosis and the vascular changes that accompany it and may have broad implications for liver cirrhosis and myofibroblast biology in a variety of other organ systems and disease conditions. NRP-1 expression correlates with activation of HSCs into a motile myofibroblastic phenotype. (A and B) Nrp1 and Pdgfrb mRNA levels in isolated rHSCs from CCl4-treated rats were increased compared with those from control rats as measured using qRT-PCR (n = 3, *P < 0.05). (C) Nrp1 mRNA levels were increased in rHSCs from BDL as compared with sham-operated rats (n = 5, *P < 0.05). (D) Five-micrometer sections of rat liver were stained with an Ab against NRP-1 (green). Liver tissues of rats treated with either vehicle or CCl4 were coimmunostained for PDGFRβ and NRP-1. Representative images for NRP-1 staining (in green) are shown in the left panels and for PDGFRβ (in red), in the middle panels; overlays of the two (in yellow) are in the right panels. Below each image is the colocalization analysis for each of the overlay images. The graph peaks represent the fluorescence intensities of the staining at the given distances (in micrometers) along the straight white bar. The white bars in the overlay images represent the area selected for colocalization. (E) Time course expression of NRP-1 in liver of CCl4-treated rats. Liver tissue of rats treated with CCl4 was sectioned at various time points and coimmunostained using NRP-1 and PDGFRβ Ab. Original magnification, ×10.